This dress is a winner!The dress wasnt too tight anywhere so it was very comfortable. I had no issues with sequins rubbing anywhere or anything like that. This dress is a winner!The dress wasnt too tight anywhere so it was very comfortable. I had no issues with sequins rubbing anywhere or anything like that. Dear customer, Thanks a lot for sending your picture with us, we really appreciate that. I hope you can share your good feedback with your social contacts. I would truly be grateful to you. Have a good day! Dear customer, Thanks a lot for sending your picture with us, we really appreciate that. I hope you can share your good feedback with your social contacts. I would truly be grateful to you. Great dress, well made and lovely colour - Fits well, you just have to make sure you read the size chart first. Great dress, well made and lovely colour - Fits well, you just have to make sure you read the size chart first. Would you say it is true to size? Would you say it is true to size? the dress came quickly. Loved the intricate design and the beading on it. I will be wearing this to my Christmas party. Shipping was quick. the dress came quickly. Loved the intricate design and the beading on it. I will be wearing this to my Christmas party. Shipping was quick. 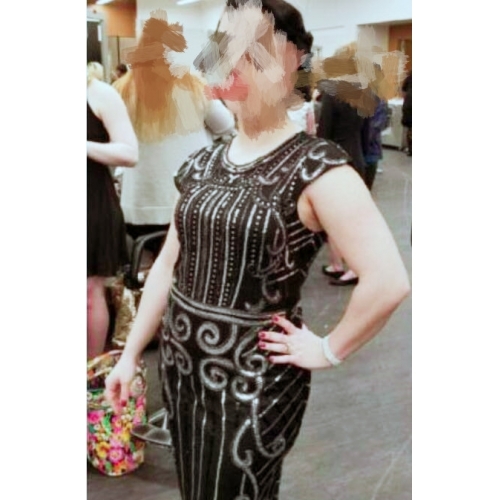 Great quality for the price and perfect for the Gatsby themed party. Delivery was on time too. Great quality for the price and perfect for the Gatsby themed party. Delivery was on time too. Detail beading on the dress is great! I’m 5’2 125 and the Medium was a little too big; should have gone with the small. Still happy though. Thank you! Detail beading on the dress is great! I’m 5’2 125 and the Medium was a little too big; should have gone with the small. Still happy though. Thank you! Dress arrived in perfect condition but bag had been opened during transit at sometime. Dress a little big but excellent quality for the price. Took 1.5 weeks for delivery. Dress arrived in perfect condition but bag had been opened during transit at sometime. Dress a little big but excellent quality for the price. Took 1.5 weeks for delivery.